Behavioral and psychological counseling are recommended for people with poor sleep habits. Recognition that psychological and behavioral factors play an important role in insomnia has led to the increased use of psychotherapy in helping sleep disorders. A study at Loughborough University in the U.K. noted that psychological treatment for insomnia improved sleep quality, reduced hypnotic drug use, and improved health-related quality of life for long-term medication users with chronic sleep difficulties. Other research has shown psychotherapy to be superior to prescription sleeping medication. In a study at Harvard Medical School, researchers said the widespread use of psychotherapy “could improve the quality of life of a large numbers of patients with insomnia. Research has indicated that psychotherapy can provide lasting change for people with sleep disorders. One study found that psychotherapy provided clinically significant sleep improvements within 6 weeks and that the improvements lasted through 6 months of follow-ups. A number of studies on insomnia and psychotherapy have used cognitive behavioral therapy (CBT) as an effective method for treating sleep disorders. One study found that CBT actually helped to change people’s fundamental beliefs about sleep habits, concluding, “CBT is effective for reducing dysfunctional beliefs about sleep and such changes are associated with other positive outcomes in insomnia treatment. These findings highlight the importance of targeting sleep-related beliefs and attitudes in psychotherapy. Guided imagery and imagery rehearsal therapy (IRT) are used in psychotherapy to help with sleep disturbances. In a study at the University of Oxford in the U.K., guided imagery helped subjects fall asleep faster and have less intrusive mind-racing thought prior to sleep. In two reviews of research into mind-body techniques such as relaxation, meditation, guided imagery and biofeedback, investigators determined that these methods were effective treatments for insomnia. A study of IRT and 24 chronic insomnia patients presented at the 2007 Annual Meeting of the Associated Professional Sleep Societies reported that IRT was an effective treatment for severe insomnia. Other research has found that even at-home use of relaxation tapes can be effective in improving sleep. Chronic nightmares occur frequently in patients with posttraumatic stress disorder (PTSD). Researchers at the Sleep and Human Health Institute in Albuquerque, New Mexico, used IRT to reduce chronic nightmares in sexual assault survivors with PTSD, thus improving sleep quality. Hypnotherapy is a procedure during which a health professional or researcher suggests that a client, patient, or subject experience changes in sensations, perceptions, thoughts, or behavior. 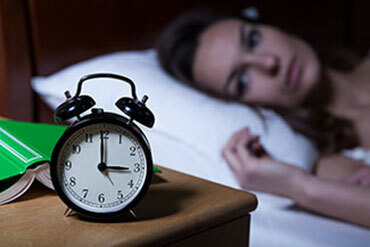 Research has consistently shown that hypnotherapy can help people with insomnia. A review of research on hypnosis noted that combining CBT with hypnotherapy was effective for a variety of psychological, behavioral, and medical problems, including sleep disorders. In one study of 45 subjects with sleep difficulties, it was shown that hypnotherapy consisting of relaxation and imagery laden suggestions helped subjects sleep more soundly for longer periods of time. Part of psychoeducation in therapy involves teaching people about adjunct therapies that can be done at home. Many psychotherapists teach their clients about music therapy because the appropriate music can assist in inducing sleep. In one study, 25 elderly people with sleep disturbances were given classical and New Age music to listen to before bedtime and whenever a sleep disturbance was identified. The participants were asked to keep daily records to assess the efficacy of the music in inducing sleep. When the results were analyzed, 96% of the participants reported improved sleep after listening to music. In another study, 60 men 60 to 83 years of age with sleeping problems listened to their choice of six 45-minute sedative music tapes at bedtime for 3 weeks. Results indicated an improvement in overall sleep quality. Relaxation techniques can be particularly effective in helping people to fall asleep. Most relaxation techniques involve repetition of a specific word, sound, prayer, phrase, body sensation or muscular activity and encourage a passive attitude toward intrusive thoughts. Some relation therapies, like progressive muscle relaxation (PMR), involve teaching patients what relaxation feels like by comparing the feeling of relaxed muscles with that of tensed muscles. PMR and other relaxation therapies have been found useful in the treatment of insomnia in a number of controlled studies. Insomnia can be triggered by psychological stress. Dealing with stress, through psychotherapy and other techniques, may be the key to a better night’s rest. Many trials have shown that psychological intervention can be beneficial for insomnia. A combined program of sleep counseling, sleep restriction methods (i.e., the only time spent in bed is when sleeping), and control of stimuli that interfere with sleep, significantly increased sleep time in a group of people with insomnia. A steady sleeping and eating schedule combined with dietary modifications and counseling sessions using behavioral therapy has been shown to reduce insomnia. Becker PM. Chronic insomnia: outcome of hypnotherapeutic intervention in six cases. Am J Clin Hypnosis 1993;36: 98–105. Graci GM, Hardie JC. Evidenced-based hypnotherapy for the management of sleep disorders. Int J Clin Exp Hypn2007 Jul;55(3): 288–302. Jacobs GD, Pace-Schott EF, Stickgold R, Otto MW. Cognitive behavior therapy and pharmacotherapy for insomnia: a randomized controlled trial and direct comparison. Arch Intern Med 2004 Sep 27;164(17): 1888–96. Krakow B, Hollifield M, Johnston L, Koss M, Schrader R, Warner TD, Tandberg D, Lauriello J, McBride L, Cutchen L, Cheng D, Emmons S, Germain A, Melendrez D, Sandoval D, Prince H. Imagery rehearsal therapy for chronic nightmares in sexual assault survivors with posttraumatic stress disorder: a randomized controlled trial. JAMA 2001 Aug 1;286(5): 537–45. Molen, Yara. Imagery rehearsal therapy improves sleep in insomniacs. Federal University of São Paulo, 21st Annual Meeting of the Associated Professional Sleep Societies, Minneapolis, Minnesota. June 9-14, 2007. Morgan K, Dixon S, Mathers N, Thompson J, Tomeny M.Psychological treatment for insomnia in the regulation of long-term hypnotic drug use. Health Technol Assess 2004 Feb;8(8):iii-iv, 1–68. Morin CM, Bootzin RR, Buysse DJ, Edinger JD, Espie CA, Lichstein KL. Psychological and behavioral treatment of insomnia:update of the recent evidence (1998-2004). Sleep 2006 Nov 1;29(11): 1398–414. Mornhinweg GC; Voignier RR. Music for sleep disturbance in the elderly. J Holist Nurs 1995 Sep;13(3): 248–54. Sivertsen B, Omvik S, Pallesen S, Bjorvatn B, Havik OE, Kvale G, Nielsen GH, Nordhus IH. Cognitive behavioral therapy vs zopiclone for treatment of chronic primary insomnia in older adults: a randomized controlled trial. JAMA2006 Jun 28;295(24): 2851–8.